This week I’ve shared several images with you that consist of “a few of my favorite things.” The final image I’d like to share with you is–surprise, surprise!–a pink flower. Most of you know my favorite color is pink, and if you’ve read my blog in the last few months at any point, you are probably aware that I rather enjoy photographing flowers. They’re beautiful, peaceful, and darnit they just make me smile! 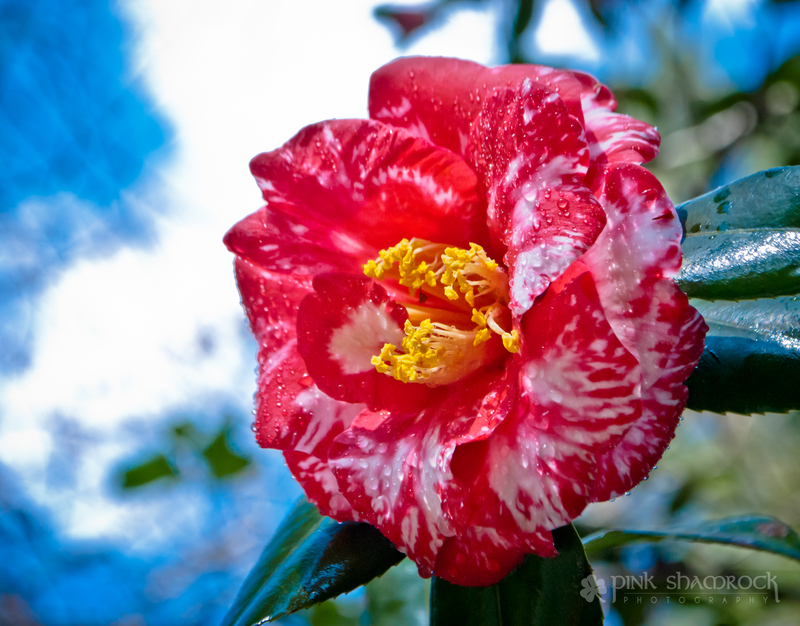 “Drenched Camellia” – A pink camellia blossom in Charleston, SC. I chose this photo today for several reasons. First, as you’ve probably noticed, I love bright, bold colors. This image certainly fits that bill. Secondly, this is my favorite flower: the Camellia. Since moving to the Lowcountry, I’ve fallen in love with these winter-blooming beauties. I should also mention that in order to take this picture, I had to dodge a rather fast-moving and powerful sprinkler and nearly got soaked a few times! Oh, the things we do for the shot! This entry was posted in Charleston, Flowers, Personal, Photo of the Day, Seasons and tagged bloom, blossom, camellia, Charleston, CHS, Erin Duke, flower, flowers, Lowcountry, macro, photo of the day, Photography, photos, pink, Pink Shamrock Photography, plantation, SC, South Carolina, trees, winter. Bookmark the permalink. Beautiful flower! Like the drops of water on it too! Fabulous red color. Nice find Erin. Love the bold color Erin. Glad to see spring is appearing somewhere. Thanks, Len! Spring is certainly making an attempt to show itself down here. Beautiful Erin and I love the droplets fo water. What beautiful colors here, Erin! Spring hasn’t quite fully sprung here yet, so this is a very timely and warming shot to enjoy! !